Threshold Editions, New York, 304 p.
Award-winning journalist Rita Cosby’s Quiet Hero is a tale of discovery – about her father’s heroic but tragic wartime experience, and the discovery of her Polish heritage. Quiet Hero is a moving homage to her father and adds to the growing body of literature about Poland and Polish people, about whom so little is known on this continent. “Scars are interesting things,” says Cosby; “they are with us for life.” Richard Cosby’s scars, physical and psychological, were uncharted and forbidden territory in the Cosby household. When her parents’ 32-year marriage broke up, the adult Rita had little contact with her father. It was only after her mother died that, going through her belongings, Rita found an old tattered suitcase in which her mother had stored away old mementos. There she found her father’s armband that he wore while fighting the Nazis during the Warsaw Uprising. A rusted tag bearing a POW number, and a prisoner identification card bearing the name: Ryszard Kossobudzki. She resolved to find out more about her father and to try to forge a closer relationship with him, to break down the barriers of silence and sort through the emotional layers that concealed the man and seemingly made him appear cold and distant. While it was Rita, the child, who wanted to do this, it was Cosby, the experienced journalist who would use her professional skills to uncover the story. In this book, Cosby shares with us how she re-examined and re-evaluated her childhood years on the basis of newfound evidence of her father’s traumatic experiences during the war. It became clear to her that her father’s wartime experiences shaped who he became as a husband and father. Resolved to repair her relationship with her father, she researched the history of his country and, through a series of interviews, she learned about the wartime experiences in Poland that shaped him and the circumstances that brought him to America. Cosby gives her readers a brief and condensed history of Poland as she lays the groundwork for her discoveries about WWII Poland. Along with Rita, the reader learns “that Poland was no stranger to conflict,” having been invaded and partitioned by three neighboring empires – the Russian, Prussian and Austrian – that effectively put Poland under occupation for over a century. The country regained its independence after World War I but 20 years later, Germany and the Soviet Union once again invaded and partitioned Poland, launching the first phase of what turned into World War II. Eventually the Nazis attacked their Soviet collaborators forcing the Soviets to join the western allies, but this new alliance ultimately enabled the Soviets to impose communist rule on Poland when the war ended. Cosby writes “Brave Poles had organized to resist the invading fascists,” but cut off from western aid they endured the most brutal occupation in all of occupied Europe and never received help during their two-month long Warsaw uprising against the Nazis in 1944 – admirably researched by Cosby – suffering a loss of 250,000 people, mostly civilians. Over the course of the war, Polish resistance tied down over 500,000 German troops and suffered 6,000,000 war dead. The most dangerous part of Polish resistance took the form of the little-known Polish organization codenamed “Żegota” (the Council to Aid Jews in Occupied Poland). We learn that any Pole who came to the assistance of a Jew was killed along with his or her family, and thousands of Poles, including babies, children parents and grandparents, were summarily executed for doing so. As the horrors of WWII fade in memory, many children and grandchildren of post-war immigrants set on a quest to try and reconstruct their family stories. 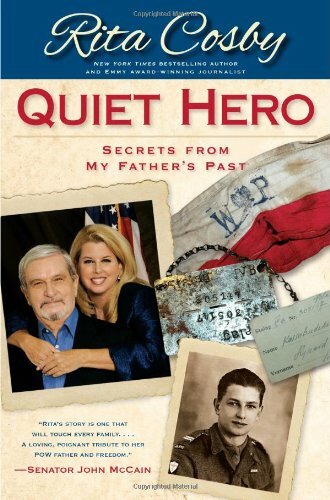 Quiet Hero is one of those quests but in this case it is in the hands of a journalist who brings her professional training in research and her writing skills to tell a riveting account of a dramatic Polish-American story. Cosby’s quest ended in a visit to Poland with her father where together they retraced the steps of his past and paid tribute to those who lost their lives in the defense of Poland.